The Turkish petrochemicals market is one of the fastest-growing in the world, with a twofold GDP multiplier over the last decade. Petkim Petrokimya Holding A.Ş., the leading petrochemical company in Turkey, has been exporting different petrochemical products to the US market for 20 years. 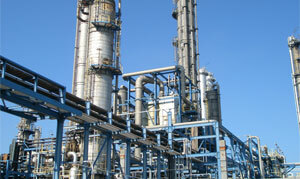 Its main export product is C4, used in butadiene extraction for rubber production. Butadiene is the basic raw material of the automotive and tire industry. Petkim’s market share for C4 is around 30-40% of the total C4 imports of the USA. Hayati Öztürk, Petkim’s General Manager, talked to TURKOFAMERICA. Located in the center of New York on the southern shore of Lake Ontario, Syracuse is a scenic treasure amid rolling hills, tranquil lakes and picturesque forests. Beside its natural richness for visitors, the fifth largest city in the state focuses on attracting the green technology industry. The city of Syracuse is one of the few cities that participates in both the New York State Empire Zone program and the Federal Empowerment Zone program as well. In late April, Governor David A. Paterson hosted 63 Foreign Trade Commissioners (FTCs) representing 37 countries in Buffalo/Niagara during a two-day trade mission with regional business leaders. Sinan Altun, Global Marketing Manager of Glaceau. In 1996, J. Darius Bikoff was checking into the purity of bottled water and didn't like that some had contaminants. He decided to create his own distilled water with added electrolytes. The resulting Smartwater, in a sleek bottle designed by Doug Lloyd, became a hit in natural and specialty food stores when it was released in 1998. As the effects of the economic crisis spreads across the United States, companies that are closing, those who cannot get their outstanding receivables, those who are freezing their investments and those who are shrinking their markets are all lining up. Vienna- Two Turkish banks in Austria primarily provide services to 220,000 Turkish people: the Vakıfbank International AG and Denizbank AG, which in 2006 was sold for 2.4 billion dollars to Dexia, the French-Belgium joint banking group. Both banks have their main offices in the same area in District 10 Vienna. Germany - The ethnic food market in Germany, which has an estimated value of approximately 6 billion Euro, engages not merely the attention of Turkish companies, but also those of the giant German producers. Senol Isikay, who has a university degree in geography, wrote his master's thesis on Turkish retailers. Washington, D.C.- According to figures of the Organic Trade Organization, located in Greenfield, Massachusetts, the consumer sales figures for the organic industry at the end of 2005 reached $14.6 billion. As the largest player in the industry, the organic food market's size is $13.8 billion. San Fransisco- Oracle is one of the legendary firms of Silicon Valley. Despite the fact that it was formed thirty years ago, is has constantly renewed itself, managing to remain one of the very top firms for years on end. Boasting the sort of "company culture" that only established businesses have, Oracle is also known for placing importance on the welfare of its workers, for its beautiful campus, and for being successful in its field. A hot spring day in New York. In Woodmere, a rich residential area of New York, it feels like life stops during the day. Even finding a restaurant after a certain hour is difficult. Ufuk Asik points out the closeness of Woodmere to the airport for selecting this deserted looking town as base for his company. The U.S. Versus The E.U. The European Union and the U.S. account together for almost 40% of world trade and every day about $2.2 billion worth of transatlantic trade takes place. The economic relationship between the EU and the U.S. is by far the largest between any two continents in history. He consumes 12 egg whites for breakfast and 12 ounces of chicken for lunch. He has six meals a day and drinks six liters of water. He tries to keep in shape by exercising three times a day. With an annual turnover of 150 million dollars, in the Turkish film sector there is a fierce competition among the film distributors. Established in 1992 by a young entrepreneur Pamir Demirtas, Pinema is one of the major players in the sector. Distributing about 1000 films until today Pinema also distributed Alexander movie by Oliver Stone.